Synopsis: [From IMDB, see Link: here] Batman discovers a subterranean colony of children in the sewer system dominated by the insane Sewer King. 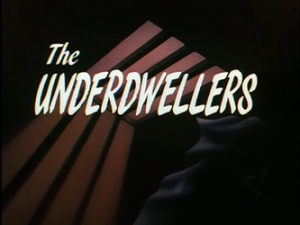 To put it plainly, The Underdwellers is a bad episode in a series that throughout its early run has shown so much promise. Yes, the first two Joker episodes (Christmas with the Joker (here) and The Last Laugh (here) respectively) were missed opportunities and there have been several instances where the writers were still finding the correct tone, but there has still been much to be admired in terms of animation, design and character development. Sadly, The Underdwellers, demonstrates weaknesses in nearly all these areas. The episode begins in standard fare, following a kind of ‘Day-in-the-life of Batman’ styled opening, which soon leads to the dark knight encountering a young Pickpocket. He soon finds that this child belongs to a group of orphans that live underground, under the command of a brutal overseer named the Sewer-King. The story functions as an ode to American urban legends, full of underground communities and crocodiles in the sewers. It is a cool touch that works well with Batman’s own mythological status in Gotham city, but is badly executed via the poor animation and scripting. In The Underdwellers, The Sewer-King appears as a grotesque and effective antagonist. One element of The Underdwellers that works fairly well is the episode’s antagonist, The Sewer-King. This is a character that appears as a Fagin/Child Catcher inspired villain, one who controls a child slave-ring under the Gotham streets. In another Batman story, The Sewer-King could have appeared as a intriguing and classically styled Batman villain. Scary, grotesque, with a big dollop of camp, the Sewer-King is an unsavory and odious villain – just as any self-respecting Batman villain should be. Following a great vocal performance from Michael Pataki, this is character that rants, bullies and manipulates his charges into randomly digging and conducting crimes for his benefit. He’s an abusive, nasty villain that perhaps in other, more ‘gritty’ or ‘edgy’ Batman media, would have be transformed into a merciless child killer (or worse). It’s perhaps for reasons of taste that we should perhaps be thankful the character hasn’t moved into other media. After all, there is a degree of distastefulness about his manipulation of these children. 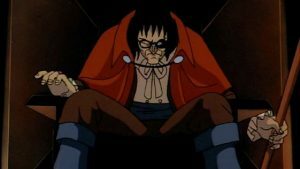 Despite this, there’s no denying the character’s effectiveness as a villain, with a particularly impressive performance from his voice actor. Batman faces off against the Sewer-King. We also get small glimpses of character development, with Batman particularly demonstrating a soft spot for children. Here, Batman brings the young orphan back to the Batcave, even going so far as to let him sleep in the mansion upstairs. Later, when Batman finally gets his hands on the Sewer-King, he states that he is sorely tempted to break his one rule after seeing his treatment of the children he controls. It is an interesting facet to the character and makes sense within the context of the character’s past. After all, here is an orphan who has himself been orphaned and wronged by the adult world. It therefore makes sense that the character would display some sympathy and dedication to protecting these children. Despite these elements, the majority of this episode simply doesn’t stack up with those that came previously. As noted, the scripting is far below the previous episodes before. Despite having three writers, the dialogue appears clunky (“A gruesome fate for a gruesome man”) and the pacing is exceptionally terrible, with the final sequences rushing desperately to fit into the episode 20 minute run time. 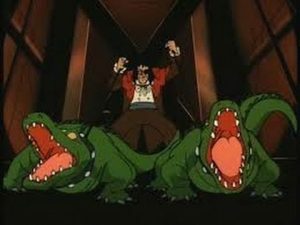 The Sewer-King’s Crocodiles demonstrate the episodes focus on Urban Legends. The animation is also a large step back. In many scenes, Batman’s cape appears static, while many of the cells appearing either blurry or lacking in detail. Not only that, the climax is particularly underwhelming. In what should have been an exciting battle between Batman and the Sewer-King’s crocodiles (a fight reminiscent of the 40s serials of Doc Savage and Tarzan) the fight descends into a farce, with Batman softly breaking a Crocodile’s jaws and then simply swining over them nonchalantly at the end. It is an effect that when viewed, is not so much a stop, as it is an abrupt crash, concluding the various plot lines without any of the time to savor any meaningful climax. Following Pretty Poison, The Underdwellers, sadly marks something of a low point in the early episodes of the series. While the main antagonist shows some promise, ultimately the script, animation and action sequences are far below the high standards set by earlier episodes. 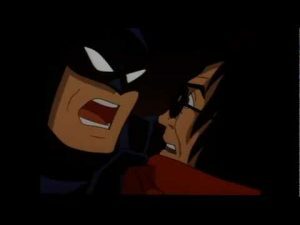 What starts as an intriguing and grotesque Bat-villain, is ultimately lost behind poor quality writing and animation. Luckily, the only way is up from here…and boy does this series deliver!